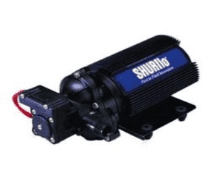 The Shurflo 9325 submersible bore pump is the solution to your remote water pumping needs. This pump is rugged, durable and built to last. Its unique water-tight power connector stops water wicking and prevents potential condensation problems. Great for livestock watering, irrigation, pond areation and remote homes. Suitable for solar powered operation. 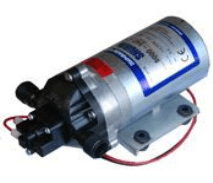 Positive displacement 3 chamber diaphragm pump. 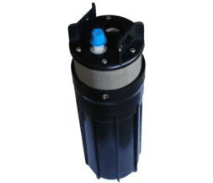 Permanent magnet motor (P/N 11-175-00)12-24 VDC nominal, 4.1 maximum amps, 70 metres maximum lift, 30 metre maximum submersion , 1/2″ Hose Barb discharge port, 50 mesh stainless steel screen inlet, 3.0 degree cam, Net weight 2.7 Kg.